If a Scarfolk citizen failed to pay his annual Organ Tax, the organ in question could be turned off by the council, and if further warning letters were ignored the organ might be completely uninstalled by council workers, known as Offalbailiffs. Many old people, as well as unemployed single parents, couldn't afford to pay the usurious Organ Tax, and frequently made ends meet by selling their innards to pay off outstanding debts. This mounting problem was eventually brought to the public's attention when 82 year old pensioner Marjorie Pierce was discovered to have sold 17 human kidneys and 5 lungs, all of which she alleged were her own. However, the two spleens she traded were revealed to be two frozen, oven-ready lasagnes. Charity organisations, such as The Insides Foundation, collected internal organs from wealthier citizens, which school children personally delivered in buckets to those less fortunate. However, when children began turning up in hospital emergency rooms suffering from the effects of purloined kidneys and pilfered spleens the practice stopped. 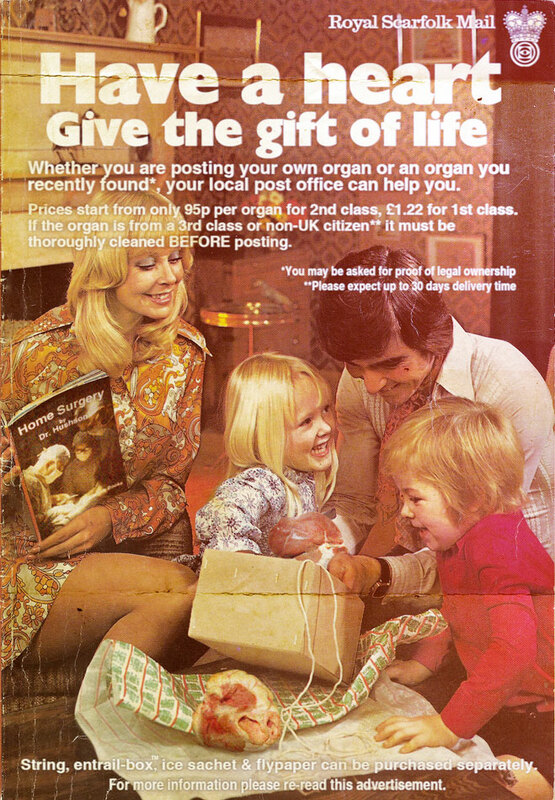 Organ donors instead turned to Scarfolk Royal Mail who quickly started offering special postal services, as can be seen from the advertisement below. I bust a gut reading this.